Over the past three years as an elected officer, I have had the privilege to visit many of the state societies. I am always humbled by the dedication, passion, and commitment of our members. I frequently reflect on the many people I have met, the many events I have attended, the many times I was privileged to represent NSPE and you. I have learned much and hopefully along the way have shared a bit of wisdom as well. Speaking of wisdom, a favorite quote of mine is by John Wesley, the founder of the Methodist church. In many ways, the engineering profession, and especially licensed professional engineers, embodies much of this quote. We work hard to make the world better in so many different ways it is impossible to list them all. As an organization, NSPE also embodies this quote. NSPE, its volunteers, staff, and state partners, work hard in many means, many ways, and many places to define, promote, and protect the licensed professional engineer, not for the benefit of the PE but rather for the public health, safety, and welfare. While this statement may seem idealistic to some, I say do not doubt or underestimate your value and do not doubt or underestimate the significance of what you do. Take pride in the meaningful impact that you have on society. Licensed professional engineers often talk about the breadth and depth of professional licensure. Breadth, defined as having a wide range of engineering knowledge; depth, having advanced learning in a specific area of practice. As I travel and attend many state conferences, I sit in on continuing education sessions on a variety of subjects, not just those in my discipline of civil engineering. While these sessions will never be sufficient to meet the breadth and depth requirement to practice in the respective areas, I find the information refreshing. In many cases, I am exposed to new technologies, practices, regulations, etc., that leave me contemplating if and how they can be applied in my area of practice. A common misperception is that NSPE is only for civil engineers. Nothing could be further from the truth. We have members from all walks of engineering life: petrochemical, aerospace, energy, biomedical, consumer products, manufacturing, transportation, and agriculture. Our members practice law; work in federal, state, and local government; teach in colleges; and work in the financial sector. They are mechanical engineers, electrical engineers, chemical engineers, industrial engineers, nuclear engineers, mining engineers, civil engineers, environmental engineers…. They are men and women from all ethnicities and all career stages. They offer wonderful perspectives based on their life experiences and their affiliations with various technical, professional, and civic organizations. It is this diversity that enriches the membership. 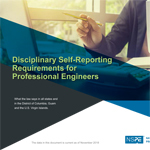 NSPE is the only professional organization that unites engineers from all areas of practice and all disciplines, brought and bound together by the professional engineering license. Author Mitch Albom says in The Five People You Meet in Heaven, “Each affects the other, and the other affects the next, and the world is full of stories, but the stories are all one.” The same is true within NSPE and in our respective professions and careers. We are all similarly challenged by, among other things, ethics, professional development, work-life balance, politics, safety, profitability, and creativity while solving complex engineering challenges—challenges that will make our lives and the lives of those around us better. Yet, our stories are one because of the professional license. My challenge for you, the member, is to take advantage of a diverse palette of continuing education opportunities and fellowship. Reach out to professional engineers from all industries, all disciplines, and all walks of life in order to embrace diversity, to share your stories, to learn from each other and to enrich each other. Expand your breadth and depth. Invest in yourself. Get to know your fellow professional engineers and revel in the richness that NSPE offers.